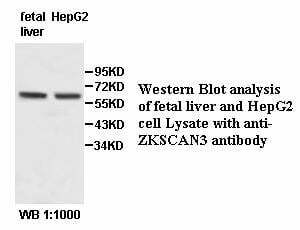 Raised against a recombinate human ZKSCAN3 protein 175-440aa (BC006118). This product is stable for several weeks at 4 degree C as an undiluted liquid. Dilute only prior to immediate use. For extended storage, aliquot contents and freeze at -20 degree C or below. Avoid cycles of freezing and thawing. Expiration date is one (1) year from date of receipt. Small volumes of anti-ZKSCAN3 antibody vial(s) may occasionally become entrapped in the seal of the product vial during shipment and storage. If necessary, briefly centrifuge the vial on a tabletop centrifuge to dislodge any liquid in the container`s cap. Certain products may require to ship with dry ice and additional dry ice fee may apply. NCBI/Uniprot data below describe general gene information for ZKSCAN3. It may not necessarily be applicable to this product. ZF47; Zfp47; ZFP306; ZNF306; ZNF309; zfp-47; ZSCAN13; ZSCAN35; dJ874C20.1; dJ874C20.1. ZNF306: Acts as a transcriptional regulator. Binds to the consensus sequence 5'-[GT][AG][AGT]GGGG-3'. Associates with chromatin at the ITGB4 and VEGF promoters. Activates the transcription of genes associated with colon cancer progression. Belongs to the krueppel C2H2-type zinc-finger protein family. 1. Suggest ZKSCAN3 as an autophagy master switch regulating the expression of a transcriptional network of genes integral to autophagy and lysosome biogenesis/function.